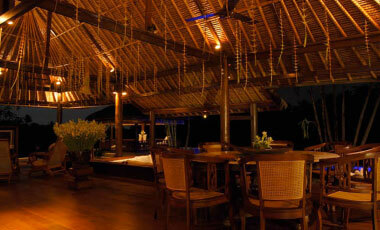 Villa Santai prides itself on superb dining services, provided by our house Chef, assistant cook, and staff members. 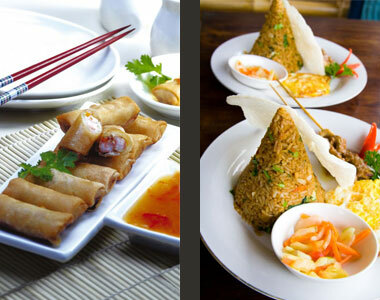 You may choose from an extensive menu of both Eastern & Western cuisine. Our assistant chef will visit the market after your food selection has been made and will purchase the food required. Food and beverage shopping is conducted on a daily basis in order to make it more convenient for guests requests to be accommodated. We offer a wide range of menu item choices for your selection, and if requested, we can suggest menu items for breakfast, luncheon and dinner. Should you have any special off-menu requests, please discuss with our onsite manager and we will do our best to fulfill your desires. 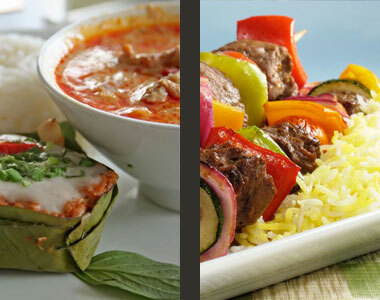 Every effort will be made to accommodate your dining requests and any special dietary needs. 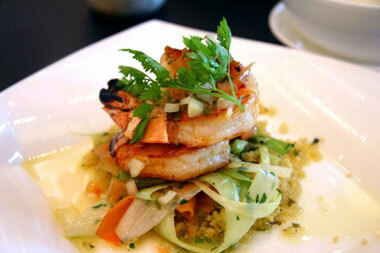 A selection of menus that our Chef specializes in preparing will be made available for your review on a daily basis. 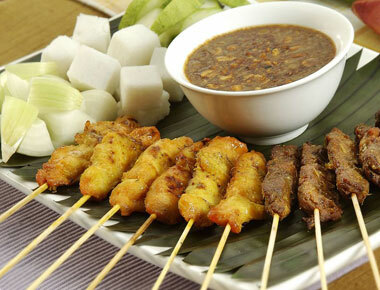 For larger events we can also easily arrange additional professional outside catering if needed. A complimentary continental breakfast is provided for each registered guest. Prior to retiring at night, we ask that you advise us of your breakfast choice and the time that you require it to be served. This is just a suggestion, as your breakfast will be served more promptly in this manner. If your breakfast is not prearranged, your order should not take longer than 25 minutes to prepare, even if you are ordering eggs or our customary local breakfast dish of mia goreng or nasi goreng. For any off menu item requests, please make a list to be given to the assistant manager to locate and purchase. You will be invoiced for the groceries of all non-complimentary food & beverage at the end of your stay. A 35% service and preparation fee will be charged upon the total of the shopping receipts. The manager will always have receipts available upon request. Some alcoholic beverage items, such as in house wine, are attracting an additional charge. You also may choose to shop for yourself, if you so desire, in which case there will be no additional service or preparation charge. Upon check-in, arrangements can also be made to be on a different dining service plan from that above. If you plan on eating out quite a bit during your stay, you may decide to go on our a la carte dining program. Under this plan you would simply be charge our menu prices for all items ordered. It is completely at your discretion which dining services program you would like to engage in, but your choice should be made shortly after your arrival. 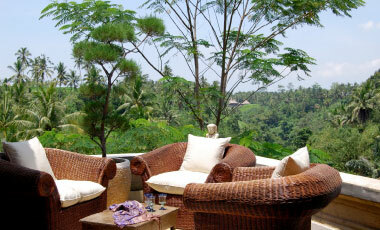 Each day our friendly Balinese staff will prepare a breakfast of fresh fruit, toast and coffee. You may augment this complimentary breakfast with eggs, fresh croissants and pastries, or anything else off the menu. 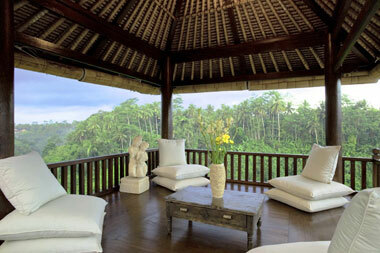 Breakfast is prepared in the fully equipped villa kitchen located near the main pavilion. 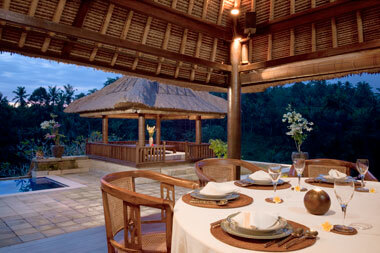 You may choose to enjoy your meal in many locations at the villa. The “sitting” bale is very nice for morning coffee. There is a large circular marble table with ten chairs that is very nice for any meal. Dinners are often enjoyed in the romantic dining bale. Some guests eat in the bar area while checking their email or in the media area while watching television. 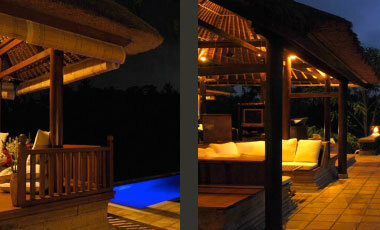 Alternatively, you may have room service either en suite or on your private deck off of each room. We advise when choosing selections from our menu for your Luncheon or Dinner that you limit the amount of different courses per person. For example, eight people ordering eight different entrées, appetizers, soups, salads, and desserts is just too overwhelming for our small team! We are very pleased to serve you for all of your dining requirements; however, advance notice is required for both luncheon and dinner, preferably at least three hours in advance. This will enable preparations including the purchasing of provisions. Drinking water, tea and coffee are provided with our compliments throughout the day. If you would prefer to supply your own gourmet coffee or espresso beans, please let the staff know. While Indonesia is predominantly a Muslim society, Bali is Hindu. You may therefore drink alcohol freely in public without attracting attention. Wine selection at the grocery store is quite limited. If you would enjoy having wine with your meals, we offer a modest selection for your convenience. Also, we will gladly assist you in purchasing your selection based on our list from a recommended wine shop. They have a reasonable range and relatively good prices. We will always have beer in stock, which will be invoiced at the end of your stay. Bintang is the preferred local beer, but if you prefer a different kind of beer, please let us make the arrangements. We also supply a modest stock of spirits; Vodka, Rum, Gin, Whisky, Liqueur, and Tequila. Our policy that is if the bottle is opened, the guest will be charged for the bottle. Guests have the choice of taking the bottle with them upon departure or leaving it for the next guest. The idea is that the villa will maintain a full bar from any previous guests leaving their bottles behind and that many guests will be able to consume alcoholic beverages for free, because the previous guests already paid the bill! A little community sharing is always nice. All alcoholic beverages are charged at cost plus 35%. Please give advance notice if you are planning on having a dinner party or unexpected guests at the villa, so as to make sure that we have the necessary inventory. Our staff will be on hand to ensure all your holiday requirements are taken care of. For food and beverage items, other than the complimentary breakfast (and water, coffee and tea throughout the day), guests will be presented with a cash bill towards the end of their stay. We can indeed make special arrangements for credit card transactions towards payment of food, beverage, government tax and service, but this must be arranged prior to your departure, as we do not have onsite credit card merchant facilities. Our staff will be happy to run errands for you and to purchase items from the local delicatessens and supermarkets on your behalf. Please give the chef as much notice as possible if you wish to have special meals prepared, so that he has time for the necessary shopping. Whilst it is entirely at your discretion, it is customary to provide a very small tip in appreciation of the villa staff. Please provide us with an idea of the type of meals that your group would like and if there are any special dietary requirements. Bintang beer is always available at the villa. 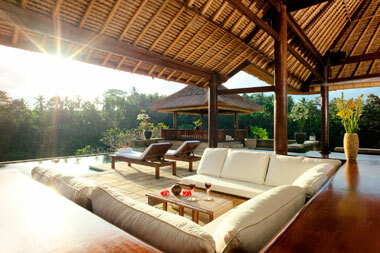 Wine and liquor is expensive in Bali and we do stock a modest quantity of each. We are also able to purchase a limited list of Alcoholic beverages from a distributor in Denpasar, but we must receive prior notice. French, Italian, Australian and Chilean wines are available. Champagne is not sold in the local stores, so that would be a special order or even better to bring it with you to the villa from your home country.